Shingle Roofing Company | Metal & Slate Roofs | GTA Roofers Vaughan Ont. GTA Ontario Roofers will amaze you with the best shingle roofing and coatings products in Southern Ontario. We provide installation of all systems, flat, shingle, cedar, whatever you have in mind. ​Our first job when we show up is to carefully inspect the roof including caulked areas, flashing, chimneys, vent penetrations, pipe boots and gutters and roof deck. Believe us when we tell you that we are thorough. In addition, roof eaves are inspected for ice damage and we check the ice protection if present. We help you avoid the icicles and ice expansion just under the shingles with proper shielding because as freezing moisture rolls off the roof, much damage is caused to eaves and damage to shingles as ice is forced under shingles leading to consequent leaking. Proper attic insulation is essential to stabilizing the temp differential between roof top and overhang. We check that too upon request and can help if any work is required. Finally, roof shingle integrity is closely examined although there are usually tell-tale signs such as granule accumulation at trough drains. We look at curling, cracking and smoothing where the shingle granules have worn off. If it's been more than ten to fifteen years since the home was last shingled, it becomes likelier that replacement is required. You are probably most familiar with Asphalt shingles; they are one of the most widely used roofing material on the residential roofing market today. ​ In recent years the shingle has been modified to include more colour, shape and size options. But the main difference from shingles of the past is the composition. Where once the mat of the shingle was made from wood and paper it is now constructed of fiberglass as the mat portion of the shingle. Most asphalt shingles last about 12 - 15 years depending on quality, weather related conditions, maintenance practices over the years and when they were installed. Newer shingles are lasting longer and also offer more flexibility with regard to colour and shapes. ​A leak does not always mean a shingle roof replacement is necessary just yet. Even relatively new shingles can leak in spotty locations, particularly around perforations in the roof like chimneys and after severe storms. Catching these signs early can be very cost effective; a cursory look at the roof or a double check in the attic every once in awhile should be adequate. Several leaks, however, shouts out the need for immediate replacement. At this point you can probably see signs on the ground around the house perimeter; the small granules that cover asphalt shingles, curled corners of the shingles. misaligned or missing shingles. ​Residential shingles vary in many ways. Consider Material, Size Shape, Color, Thickness and, of course, quality. Historically shingles were not reinforced as much as they are now, and will last longer. If your roof has shingles twelve years or older, you need to have the roof inspected for deficiencies. Chances are you can repair anything that comes up but you should be sure the roof is still protecting you from leaks. What is a better choice, organic or fiberglass asphalt shingles? 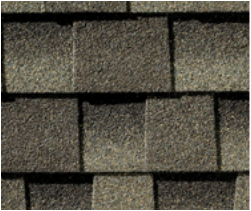 Organic shingles are made of a felt material created by saturating paper with asphalt so it becomes waterproof. Then a coating of asphalt adhesive is applied on top and ceramic roofing granules are embedded, giving the shingles durability and UV protection. Organic shingles contain 1 1/2 to 2 times as much asphalt as fiberglass shingles, which gives them more weight and stability. Fiberglass shingles are made with less asphalt and tend to be better in warmer climates, not performing as well in the colder north. They can get brittle and crack more easily than organic shingles. They are still referred to as Asphalt shingles because it remains the primary exposed material however the use of fiberglass has provided more durability, become more fire retardant and has allowed a better colour selection. 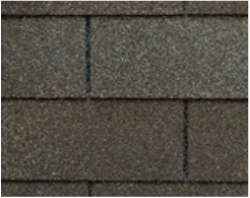 Their thicker layered construction of organic shingles makes them generally last longer, enabling more years to be added to the warranty. While the eco movement in the last decade prompted many changes in building materials, ironically the wood and paper (organic) roof shingle required more asphalt to complete the composition which makes it less eco-friendly.The fiberglass product can actually be recycled as road tar filler. The fiberglass product is recommended for sloped roofs in Ontario. Easy to install, durable between 20 and 40 years life expectancy depending on quality and affordable relative to other materials. Affordability . Lifespan is acceptable . Ease of installation . Modern look and variety has become more extensive . ECO - Asphalt shingles can be recycled making them acceptable material. Do not weather as well as other materials like shakes, clay or metal. Sleet, ice and high winds wreak havoc on asphalt shingles. Chances are that you will have to replace some along the way before the lifespan of the roof has been reached. ​Aside from an interesting rustic appearance, cedar roofing has exceptional thermal insulation properties. Ontario's winter blast will be felt a bit less as these bad boys provide significant insulation over asphalt shingles. They also take much less energy to produce them. There are many other types of wood roofing products available such as fire-rated or pressure-treated shakes and shingles. Cedar is actually a fairly strong wood. The nature of the material and fastening system means it adds strength to a structure. Cedar also resists moisture and decay no different than a cedar deck with natural inhibitors. Hailstorms do not affect the roof and winter storms nothing to fear for a cedar shake or cedar shingle roof. ​Metal materials of zinc and aluminum along with acrylic usually make up metal sheet roofing panels. The minimum slope of a roof must be 3/12 pitch, or 3" elevated for every 12" length. It is however, a more expensive alternative but the cost differential is made up by the longer lifespan and reduced maintenance. There are also some energy benefits as well, even in the winter months. Metal roofing comes in designs such as Cedar shake, Mediterranean clay and Dutch clay tile appearances. Metal roofs look beautiful and last much longer; lowest cost per-annum coverage (50 year warranties); metal roofs are rated highest fire resistance; less structural stress; stain and mildew are never an issue; they provide excellent wind resistance - ie; Class A wind resistant (up to 150mph); environmentally friendly, 100% recyclable; very little maintenance. colour coverings are guaranteed to hold for decades. An environmental alternative that completely replicates the look of split cedar shakes. You and observers will never be able to tell the difference in appearances, however, there can be no doubt about the durability and longevity these roof tiles will provide. The shakes are made from recycled tires, plastic and cellulose materials making them extremely eco-friendly due to the lessened stress on waste sites. It takes about 16 tires to make about 1,000 sq. ft of roofing. Will never rot, blister, peel or crack; Resistant to fire, mould, mildew and insects; Hail resistant and no treatments or preservatives required. The only downside is price but not so much; the system costs about the same as cedar shingles and will last a long, long time with very little upkeep. Natural roofing slate has been used to cover abodes for many centuries, keeping our ancestors protected fro from the elements and looking just fine as well. It wouldn't be a stretch to say that today's slate roof coverings look a little more sophisticated than days long ago, but still maintaining the beautiful cultured, rustic appearance. The slate roof is the of choice of some of the world’s most prestigious and valued structures. When it comes to roofing, nothing approaches the magnificence of natural slate shingles. Hundreds of millions of years in the making, slate exudes majesty and character and is perhaps the most valued sloped roof shingle by top architects world-wide. When it comes to choosing the longest lasting roof covering available, look no further than slate and clay tiles. Expect no less than 50 years of beauty once these are installed. Restoration projects or new roofs, slate is an incredibly gorgeous way to show off the finished home. Don't plan on moving anytime soon so you can enjoy these babies for decades. Give us a call and we can go over any roofing options you are considering. Take a look at our siding products and services. Residential flat roofing expertise. Don't be fooled. Remember we specialize in residential flat roofing. The experience from large building roof replacements has given us the expertise to bring top quality flat roofing replacement to your home. Roof contractors who focus mostly in sloped shingle roofing, and attempt to do flat roofs often have difficulty in perfecting their work. Botched residential jobs due to lack of know-how is not that rare, We have seen blistering, and joints and flashing issues in our travels.